9.20pm: The tide at Boyne-Tannum was a lot higher than this morning's peak, and the area is officially an isolated island now with Old Tannum Rd cut off and South Trees Bridge under water in several spots. It's believed Boyne Island's Malpas Rd residents will be some of the most affected by floodwater. 8.50pm: Some Boyne Island and Tannum Sands residents are reportedly ignoring Gladstone Police and SES commands to leave their flooded properties. Gladstone Police said that by law they did have the authority to evacuate residents from their homes. More than 400 residents are being doorknocked tonight by Gladstone Police and SES workers. Boyne Island Rd and Malpas Street, near the South Trees Inlet, have been closed. It's believed authorities are trying to get residents out of their homes and to safer ground before high tide. The evacuation comes as Gladstone Regional Council Emergency Communication Centre confirmed that Boyne Island would enter lockdown around 9pm. Gladstone Mayor Gail Sellers has disputed claims the road to the Tanyalla Evacuation Centre in Caledon St, Tannum Sands will be closed. Mayor Sellers said that families were now using the 70-bed facility. "It seems a lot of people have found refuge with family and friends," she said. Deputy Mayor Matt Burnett and councillor Maxine Brushe will spend the night with emergency services and residents at the Tanyalla Centre. Mr Burnett said Prime Minister Julia Gillard and Federal Treasurer Wayne Swan had assured Cr Sellers they would be of assistance. 8.30pm: People are being asked to stay at home, with reports of fallen trees across the region. 8.15pm: Boyne Island will be in lockdown around 9pm as the high tide cuts off all arterial roads to the area. Tides of up to 3m are expected to result in a surge of floodwaters. Gladstone Regional Council emergency call centre says motorists have been ignoring road closure signs and driving through floodwaters. Police are doorknocking in the area asking people to leave their homes. Read the latest tweets on the Queensland floods. 7.50pm: Mayor Gail Sellers says conditions are going to be difficult for a few more days and is asking for everyone's co-operation. 7.20pm: The latest updated from the weather bureau says Ex Tropical Cyclone Oswald is slowly moving over the Central Highlands and Coalfields district, about 100km east south-east of Emerald and 220km west of Gladstone. It is expected to move south south-east this evening and through Sunday, contracting into New South Wales on Monday. There's still a possibility of tornado activity affecting areas through the Wide Bay and Burnett district. 7pm: Residents living within the one-in-100 flood zones have been asked to evacuate their homes as rising water threatens properties in the Boyne Island, Tannum Sands and Benaraby areas. 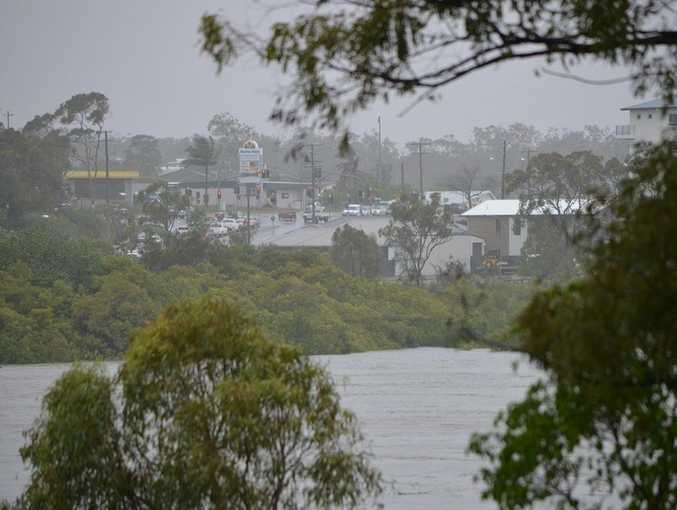 Gladstone Mayor Gail Sellers said the evacuation of residents was being encouraged by the Queensland Police Service following record level flooding of the Boyne River. "I am asking residents in areas one metre above Q100 levels to stay alert, watch the weather and consider seeking shelter with family or friends," Cr Sellers said. "For those without anywhere to stay, the Tanyalla Camping and Conference Centre in Caledon Street, is providing refuge with food being provided by the Salvation Army." Cr Sellers advised those evacuating to pack lightly, taking only necessary personal items, pillows, blankets, and medication. Cr Sellers also reminded residents to obey road signage and take care when travelling. "With around 50 roads closed and potholes forming across the region it is important for the community to keep up to date with changing road conditions and to stay alert for weather and flood warnings. 6.53pm: A fifth tornado has hit Burnett Heads. Two houses have roof damage and there are powerlines down. And another round of damaging winds and rainfall is set to lash the Gladstone coast tonight. It's believed winds of 110km/h and more than 100mm of rain will hit the Capricorn Coast later this evening. Full story here. 6.50pm: The Bureau of Meteorology reports some areas through the southern Capricornia region have now recorded more than 1000mm of rain over the past 48 hours. 6.15pm: The water level for the Boyne River is the highest to-date. Multiple Boyne-Tannum residents are starting to organise their important documents and belongings and making plans in case they are forced to evacuate at high tide arrives again at 9pm. Water has built up in the driveways of some Boyne Island residents, meaning they are unable to move their cars. 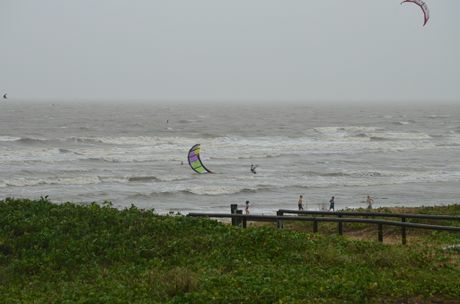 Tannum Sands beach being closed hasn't stopped kite surfers using the wind to their advantage. This afternoon many people were out and about despite the weather, using the opportunity of having lighter rain to stretch their legs during a walk on the beach and see the sand ripped out by the high tide. There were boogie boarders and families looking at the debris along the tide line. There are reports of another tornado at Burnett Heads, and the possibility of a tornado 30km west of Maryborough. The latest flood warning for the Calliope, Boyne, Baffle and Kolan Rivers is here. 6pm: RACQ CQ Helicopter Rescue attended the rescue of a mother and her 14 month-old baby from floodwater near Biloela late this afternoon. It's believed the woman's vehicle became trapped in floodwater between Callide and Kroombit Creek. 5.45pm: Rio Tinto Alcan has started a controlled, temporary stoppage of its Yarwun refinery after the sites Residue Management Area started flowing from the spillway into Gravel Creek this afternoon. Full story here. 5.40pm: There are reports of a car trapped between the Kroombit and Grevillea Creeks outside of Biloela. It is believed Queensland Fire and Rescue Service and SES teams have been notified. And Banana Shire Mayor Ron Carige has proved just how far he will go for the shire after he was forced to sit on the roof of his car for five hours after getting stuck in a flooded causeway. 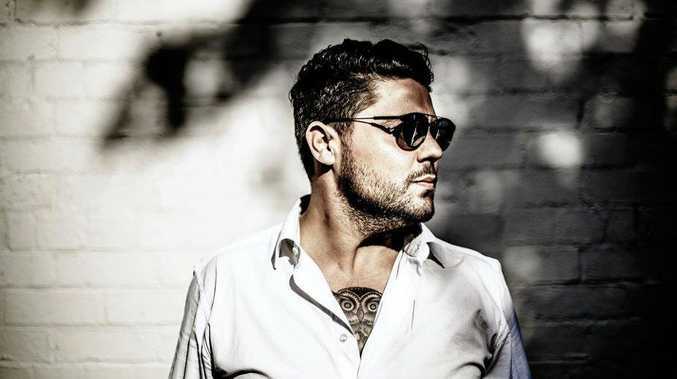 Cr Carige was on his way to Biloela to lead the Banana Shire disaster team when he was caught out. SES crews came to Cr Carige's rescue at a causeway before Bells Creek, after property owners saw his cars lights. "We ended up getting in at about 1:30am this morning," Cr Carige said. "I was just caught out." 5.10pm: Gladstone Regional Council has confirmed that Boyne Island Rd will remain open until flood waters rise later tonight. The road is the main traffic arterial for Boyne Island and Tannum Sands residents to get to Gladstone. It's believed the bridge over the South Trees Inlet will flood when the tide climbs up to three metres tonight. A Gladstone Regional Council representative said at this stage the road would remain open. For an updated list of road closures click here. 4.45pm: The latest from the weather bureau: At 4pm, Ex Tropical Cyclone Oswald was slow moving over the Central Highlands and Coalfields district, about 75km east northeast of Emerald and 250km west northwest of Gladstone. It is is expected to move south southeast this evening and through Sunday, contracting into New South Wales on Monday. Damaging winds with peak gusts of around 110kmh are possible over the southern Capricornia district, particularly near the coast, and over southern parts of the Central Highlands and Coalfields districts, particularly over higher terrain. These winds are likely to start easing as the system begins to move southwards late tonight or early Sunday. Heavy rainfall may lead to flash flooding and worsening of the existing flood situation over the southern Capricornia and southeastern parts of the Central Highlands and Coalfields districts. Locations that may be affected include Gladstone, Seventeen Seventy and Theodore. Six hour rainfall accumulations in excess of 100mm are possible, potentially leading to further rapid river and stream rises in the area. Twenty-four hour rainfall totals to 9am Sunday are likely to exceed 250mm. This area of heavy rainfall is expected to contract south from late tonight or early Sunday. Currently, the heaviest rain is located on radar over the southern Capricornia district and through the Wide Bay and Burnett district. Areas near Gladstone and south to Bundaberg recorded 200 to 500mm in the 24 hours to 9am Saturday. Some areas through the southern Capricornia have now recorded over 1000mm over the past 48 hours. A number of locations, including Rockhampton and Gladstone, have recorded their highest daily rainfall totals. 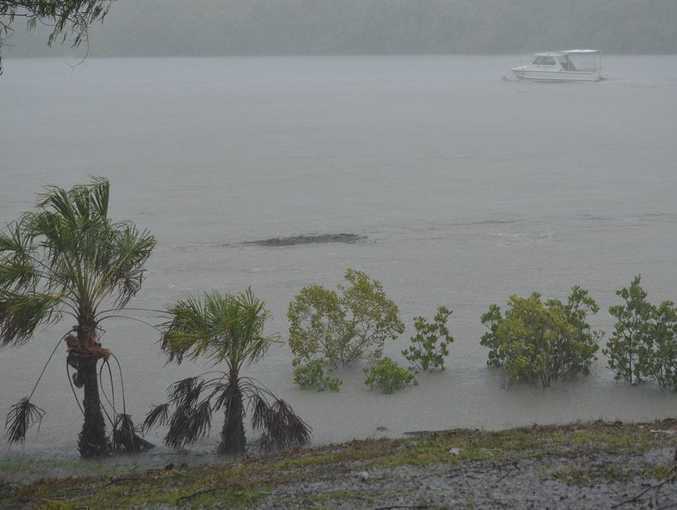 Water levels on the high tide Sunday morning are likely to exceed the highest tide of the year about coastal and island locations near and south of Gladstone. 4.30pm: Gladstone Mayor Gail Sellers says: "If you are in one of the 400 homes in the Boyne-Tannum and Benaraby areas and have family or friends in Gladstone, and are thinking of going to stay with them if necessary, please consider self evacuation." 4.22pm: Premier Campbell Newman is remaining tight lipped about his whereabouts tomorrow, but reports suggest he may be travelling to Central Queensland. 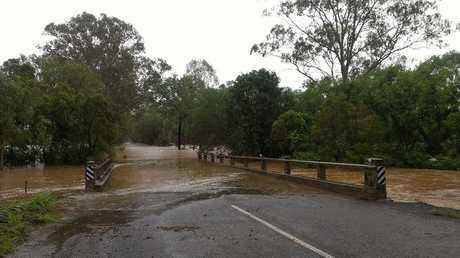 4.20pm: Flooding on the Hut Creek Bridge on Gentle Annie Rd, Ambrose. Reader pic sent in by Tess Hargreaves. Residents in Boyne Island and Tannum Sands remain on high alert as torrential rainfall lashes the Gladstone region this afternoon. More than 50 roads remain closed in the region with between 400-500 properties placed on high alert. At this stage no residents have been evacuated from their properties. This afternoon councillor Maxine Brushe said no residents had sought refuge at the Boyne Island Tannum Sands community centre. Gladstone Airport remains open with QantasLink and Virgin Australia experiencing delays and cancellations. 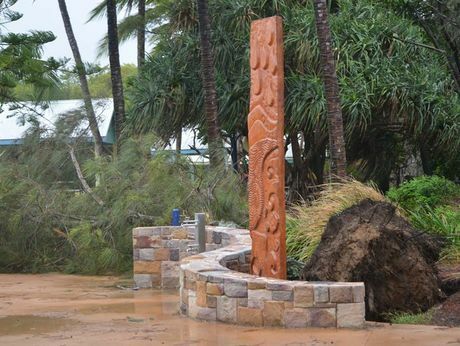 Gladstone Regional Council will be holding another Local Disaster Management Group at 5pm. 4.05pm: Gladstone Mayor Gail Sellers has advised residents not to worry about the Awoonga Dam wall, saying it is safe. Earlier today authorities said they were confident the dam was functioning according the plan and there was no need for panic. Gladstone Area Water Board chief executive Jim Grayson the situation was well within the design and capability of the dam. Full story here. 4pm: Gladstone Airport will remain open despite predictions of heavy rainfall later today. Full story here. 3.45pm: The Bureau of Meteorology advised the Gladstone region to expect between 200-300mm of rain and strong winds over the next 12 hours. Gladstone Mayor Gail Sellers has reminded residents to stay alert for weather and flood warnings following the rapid rise of Lake Awoonga threatening surrounding properties this morning. Cr Sellers said the Local Disaster Management Centre had been activated and an emergency alert issued to residents residing within the one-in-100 year flood zones in the Boyne Island, Tannum Sands and Benaraby areas. "The Local Disaster Management Group will reassess the expected flood levels in the Boyne River at this afternoon's meeting at 5pm." Cr Sellers advised residents in the Boyne Island area to self-evacuate if concerned about their property and to exercise caution when doing so. "Please seek shelter with friends and family if possible. Alternatively, the Tanyalla Camping and Conference Centre in Caledon Street, Tannum Sands, will be available from 5pm as a place of refuge," she said. "If self-evacuating, it is advisable to take a pillow and blanket, personal items and medications. "Food will be provided by the Salvation Army. "It is very important that, if self-evacuating, you let friends and family know that you are going to do so." "With around 50 roads closed and potholes forming across the region it is important for the community to keep up to date with changing road conditions and to stay alert for weather and flood warnings." 2.49pm: The Bruce Hwy south of Rockhampton has re-opened to Mt Larcom. Anyone travelling further south should stay in Rocky. Gracemere and Mt Morgan are both accessible from the north. 2.10pm: Queensland Premier Campbell Newman is holding a press conference about flooding in Queensland. He said the situation in Gladstone had deteriorated today, and urged everyone in affected areas to take heed of emergency message. He said a disaster situation had been declared in Gladstone following significant inflows into Awoonga Dam. Mr Newman said there were 400-500 properties downstream that could be impacted. He said another dam - a saddle dam - which blocks part of a gully leading to the Boyne Valley could impact another 500 homes. "We are concerned we could see water overtopping the saddle dam," Mr Newman said. "QPS is taking this very seriously right now." Mr Newman said there were concerns with beaches along the coast, with beaches down to the border being closed. He said people are being urged to stay out of the water so surf lifesavers don't have to risk there lives. He said he understood people were anxious, but assured residents government officials and local government leaders were all working together as a team to do everything they could to affect communities. Prime Minister Julia Gillard has offered the support of the Commonwealth, Mr Newman said. 1.45pm: Qantaslink has advised passengers travelling between Brisbane and Gladstone that there are no scheduled delays or cancellations. 1.30pm: Boyne-Tannum residents are holding out to see what damage tonight's high tide will bring. The Boyne River at Tannum Sands rose to well above the level of the 2011 floods this morning, but levels eased after the tide peaked. The weather has gone through spurts of calming down to only come back with heavy onslaughts of rain and strong wind. The situation has the community abuzz with trepidation and many people are flocking to the shopping centres to stock up. The majority of people shopping were sensible, not going overboard but gearing up with essentials to get them through the what is as yet an undefinable period. However, a different picture can be presented for the roads in the community. Many residents have not heeded Mayor Gail Sellers' warning that the rains were not an occasion for sight-seeing, instead filling up streets along the river with traffic. Even with the weather, many people aren't letting the rain stop their Australia Day celebrations, with low key events taking place. 1.05pm: Just when you thought the rain might be easing, a massive downpour has hit Glastone in the past half hour. From noon to 12.30pm, 17.2mm of rain fell. That's significantly more than other half hour blocks over the past two days. From 9am to noon, 8.2 mm fell, which was relatively quiet compared with the past two days. Since 6pm on Thursday night, 667.4mm of rain has fallen in Gladstone. 1pm: Observer reader Anita Graham has sent in these photos of Lake Awoonga and surrounding areas. 12.41pm: Telstra is working on fixing landline and broadband services to residents in Gladstone, Rockhampton and Emerald. The severe weather and flooding around Rockhampton has impacted two cables servicing the region. Repairs and testing will continue until full restoration is complete. At this stage there is no estimated time of full repair. 11.56am: It's been reported the lights at Toolooa St and Derby St are out. Tannum Sands Surf Life Saving Club says the beach is closed and has asked people to avoid going into any water. Nippers has also been cancelled tomorrow. 11.30am: Boyne Island resident Lee McIvor can't say enough about emergency services in the wake of evacuation alerts this morning. Located along the river at Boyne Island, Ms McIvor said she received a warning at 5.30am that there could be flooding along the Boyne River. "I think it is great," Ms McIvor said. "Everyone knows there is a potential for this." With police and SES present in the area Ms McIvor said she felt safe. "I think it has been well done." She said without the text this morning she would have had no idea about the risks facing residents living in her area. 11am: Mayor Gail Sellers says Premier Campbell Newman has been speaking with the Prime Minister about Gladstone's communication problems with Telstra. Local Government Minister David Crisafulli and Community Safety Minister Jack Dempsey also have been in touch, offering their support. 10.45am: The high tide has come and gone in the Boyne-Tannum area, and homes in low-lying areas have so far escaped major flooding. But local disaster co-ordinator Mark Holmes said the threat was far from over, with many low-lying public areas under water and more rain on the way. "We're still expecting an issue with the high tide tomorrow morning and even this evening, depending on the rate of increase in the dam and the rate of increase in the rain." 10.15am: Gladstone Mayor Gail Sellers has assured residents there is no truth to the rumour that Awoonga Dam has burst its banks. "It's all safe," she said. 9.45am: The traffic lights on Toolooa and Breslin Sts are completely out, so people are advised to take extreme care if they have to drive. 9.30am: Awoonga Dam was sitting at 45.5m as of 8am this morning, almost one metre higher than its previous record of 44.6m. Mayor Gail Sellers said Gladstone was in unchartered territory at the moment. "We have 400 homes that could have water in them according to the Q100 specifications," Cr Sellers told The Observer. Each and every one of those homes has received a knock on the door from police and SES and also a notification via text message. The Boyne Island Community Centre has been set up to receive people affected by flood waters who have nowhere else to go. Cr Sellers said so far no-one had used the service. Queensland Premier has phoned to check in on Gladstone, and Cr Sellers said she spoke with him about telecommunication problems facing some residents. "He is doing his best to try and rectify that," she said. With the bad weather continuing, Cr Sellers urged people to be cautious and not take any unnecessary risks. "We don't want any sightseers," she said. The Mayor also urged children and thrill seekers to stay out of flood waters and not to play in them, especially in the Boyne Island-Tannum Sands area. 9.15am: Observer reporter Lisa Maynard, who lives at Boyne Tannum, says almost all the meat is sold out at Tannum Sands Coles, and milk sold out on Friday. She said a fire alarm went off at Coles at 8.30am and people had to evacuate the centre. There are surfers still in the water enjoying the massive waves, and plenty of debris in the waterways. 9am: It's been reported Awoonga Dam is at 45m, which is 1m higher than it was during the January 2011 floods. 8.45am: Boyne Island and Tannum Sands residents are remaining calm as the high tide approaches. Riverside Drive resident Joanna Driver said she wasn't too worried at this stage. "We've got a big retainer wall for it to come up," Ms Driver said. For now it is business as usual. Ms Driver has gone to work but said her daughter was home and keeping an eye on the situation. "My daughter will give me plenty of warning and what needs to be done we'll do," she said. 8.20am: Reports have been received that water is going over the road at Tarcoola Drive, Boyne Island, with high tide still half an hour away. 7.58am: Gladstone Mayor Gail Sellers has been speaking with Queensland Premier Campbell Newman, who wanted to make sure all was being handled in the Gladstone region. This picture shows the storm surge overview of the Boyne Island and Tannum Sands region. The green areas show the Q100 flood area, while the purple identifies a development line which allows an additional metre. 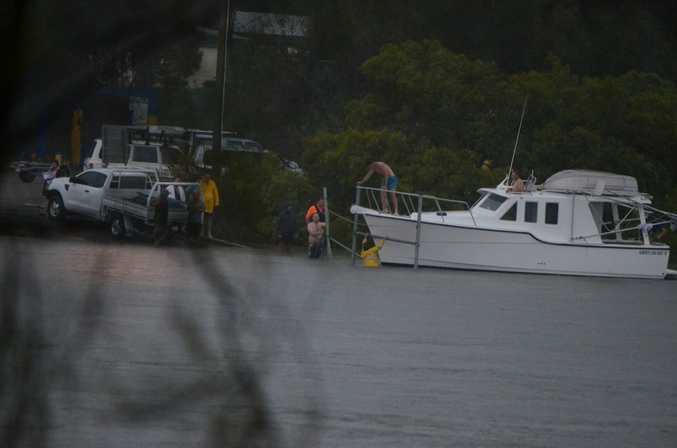 7.42am: Low-lying areas of Boyne Island may need to be evacuated, with a 4.5m tide expected this morning. Residents in Boyne Island and Tannum Sands received notification by text message at 5.30am that they may need to go. Gladstone Mayor Gail Sellers said the situation was unchartered territory because of the level of Awoonga Dam. "The dam has never been this high," she said. "It was 5.8m over at 5.45am this morning." About 400 homes at the end of the Boyne River may be affected. An evacuation centre has been opened at Boyne Tannum Community Centre. Council staff are keeping an eye on the high tide expected at 8.45am. Residents say the river is flowing rapidly and there is large debris in the water. 5.55am: A FLOODING emergency alert has been issued for Gladstone with the Boyne River expected to break its banks. The Local Disaster Management Group at Gladstone has advised flood levels along the Boyne River will exceed 1 in 100 flood levels on the morning high tide at 8.45am and evening high tide at 9pm. Water levels on the high tide this morning are likely to exceed the highest tide of the year about the coastal and island locations about and south of Gladstone. The Gladstone Region Local Disaster Management Group reports the rate of rise in the Lake Awoonga Dam level has been rapid overnight. The high flood level is expected through Boyne/Tannum and Benaraby today and tomorrow. Boyne Tannum Community Centre will be available as a place of refuge if required. Phone alerts and door knocking has begun for people living near the Boyne River. The ABC reports police and the SES are worried the Boyne River will break its banks toda,y so they have been doorknocking homes in the area. They are asking residents to prepare their homes for possible inundation. If they're in a low-lying area, residents there should go to a friend's house or a family's house that is on higher ground. It's been reported the river is now at the same height as the floods two years ago, and it's still a few hours until the morning's peak. People are asked to take the necessary action to prepare their properties and if necessary evacuate to higher ground. For information listen to your local radio station or log on to www.disaster.qld.gov.au for further advice or official direction from emergency services. Only call triple zero (000) if you or your property is in danger or if someone is injured. The community will be notified when there is no longer a flooding threat. The State Emergency Service received more than 650 requests for help in the 24 hours to 5am this morning, with about 415 of these were in Central Queensland. There were more than 130 call-outs in Rockhampton, and more than 35 jobs each for Gladstone and Yeppoon. Bundaberg SES also had more than 35 requests for assistance. Jobs were mostly for leaking roofs, fallen trees and flooding. Queensland Fire and Rescue Service personnel rescued a person from a vehicle at Smoky Creek, north of Biloela, before 1am this morning after the vehicle was caught in floodwaters. Gladstone has received 210mm of rain since 9am Friday. The Bureau of Meteorology reports that at 4am, Ex Tropical Cyclone Oswald remains slow moving over the Central Highlands, about 100km north-east of Emerald and 160km west north-west of Rockhampton. It is expected to begin moving towards the south south-east later today. A trough extends from Ex Tropical Cyclone Oswald to the southern Capricornia coast. Damaging winds with peak gusts of around 100kmh are possible over the southern Capricornia district, particularly near the coast and over the southern parts of the Central Highlands and Coalfields districts. The winds are likely to start easing as the system begins to move southwards later today. Heavy rainfall may lead to flash flooding and worsening of the existing flood situation over the southern Capricornia and sout-heastern parts of the Central Highlands and Coalfields districts. Six hour rainfall of more than 100mm are possible. The heaviest rain is currenlty located over the southern Capricornia district. Rainfall in excess of 350mm has been recorded in the area since 9am Friday and in excess of 700mm in the less than two days, leading to rapid river and stream rises in the area. Flood warnings are current for various rivers and streams in these districts. See www.bom.gov.au/qld/warnings.